In anticipation of Thanksgiving, I’ve been doing some serious pumpkin pie research. Mostly because I’ve only eaten it once, and had (not surprisingly) never made it before. For these reasons, I was delighted that my first attempt was a resounding success. Custard pies used to scare me, but after making a ton of Indian Pudding and Grapenut Pudding this year, a crust-encased pumpkin pie felt like a snap, and the aroma coming out of my oven more than made up for the mess I made putting the pie together. Does anything smell better than REAL pumpkin spice leading up to Thanksgiving? 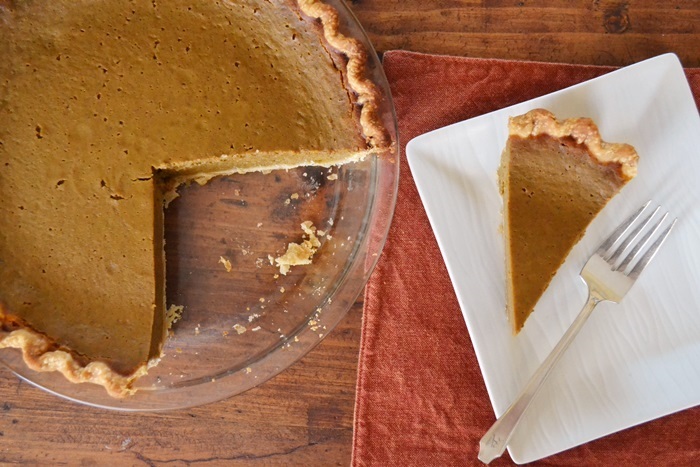 Unlike the common “back of the can” recipe for pumpkin pie (which relies on evaporated milk), this recipe uses the old-fashioned method of cooking the spiced and sugared pumpkin puree on the stove top before whisking in eggs, milk, and heavy cream. By using a food processor or sieve at a few key points in the recipe, you’ll end up with a satin-smooth custard that is perfectly flavored with cinnamon, ginger, nutmeg, and cloves. In the spirit of honesty I will admit that I used a refrigerated “ready-made” crust when I made the pumpkin pie you see here. My mission was testing pumpkin pie fillings so I spared myself the joys of working ice cold butter into flour, chilling it, and rolling it out, but I will (of course) be getting out my rolling pin for the official Thanksgiving version. What’s on your list for Thanksgiving? Last year I know I made a vegetarian stuffing but I cannot for the life of me remember what was in it. I think I also made challah knot rolls and the Italian clove cookies my mom loves, only I over-baked them (cocoa is deceptive when checking for done-ness) and she had to pretend (unconvincingly) that she wasn’t sorely disappointed. This year that won’t be an issue, though, because as co-habiting adults, John and I will now be alternating Thanksgiving and Christmas Eve between our two families, meaning two weeks from tomorrow we’ll be heading to Plymouth. I always look forward to spending time with John’s family, but the history dork in me is additionally delighted to celebrate a Thanksgiving in Plymouth. What’s up, pilgrims!? I hope you and your family have a terrific and delicious Thanksgiving! Place pastry into 9-inch pie plate and crimp as desired. If not already cold, refrigerate for 20 minutes (or freeze for 5 minutes) to firm. Use a fork to prick bottom and sides of the shell at 1/2-inch intervals. Flatten a 12-inch square of aluminum foil inside shell, pressing it flush against corners, sides, and over rim. Prick foil bottom in about a dozen places with a fork. Chill shell for at least 30 minutes to allow dough to relax (you can skip this step if your crust was ready-made). Adjust an oven rack to lowest position, and heat oven to 400 degrees. (Start preparing filling when you put shell into oven.) Bake 15 minutes (10 minutes for a ready-made crust), pressing down on foil with mitt-protected hands to flatten any puffs. Remove foil and bake shell for 8 to 10 minutes longer (less for ready-made), or until interior just begins to color. For the filling, combine the first 7 ingredients in a food processor and process for 1 minute. Transfer the mixture to a 3-quart heavy-bottomed saucepan and bring it to a sputtering simmer over medium-high heat. Cook, stirring constantly, until thick and shiny — about 5 minutes. As soon as pie shell comes out of oven, whisk heavy cream and milk into pumpkin and bring to a bare simmer. Process eggs in food processor until whites and yolks are mixed, about 5 seconds. With motor running, slowly pour about half of hot pumpkin mixture through feed tube. Stop machine and scrape in remaining pumpkin. Process 30 seconds longer. Immediately pour warm filling into hot pie shell and bake until filling is puffed and lightly cracked around edges, about 25 minutes. The center should wiggle like gelatin when pie is gently shaken. Cool on a wire rack for at least 1 hour. 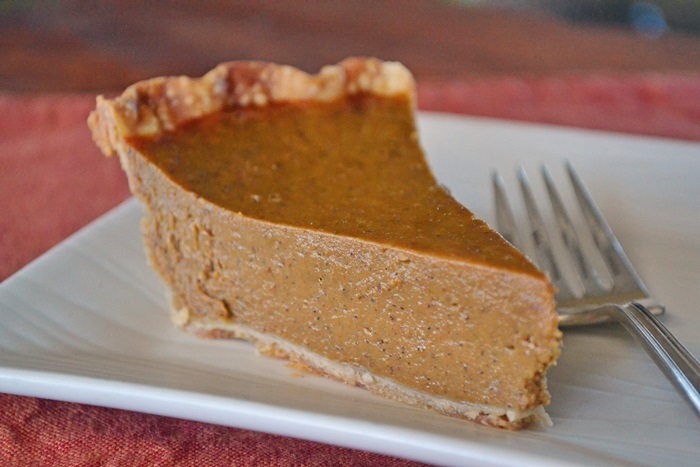 Click to view and print the recipe for Spicy Pumpkin Pie. There is no Thanksgiving like a Plymouth Thanksgiving! Wait until you hear all of the 2020 celebration buzz going on here! Good times for America’s Hometown! : ) This pie sounds just heavenly! 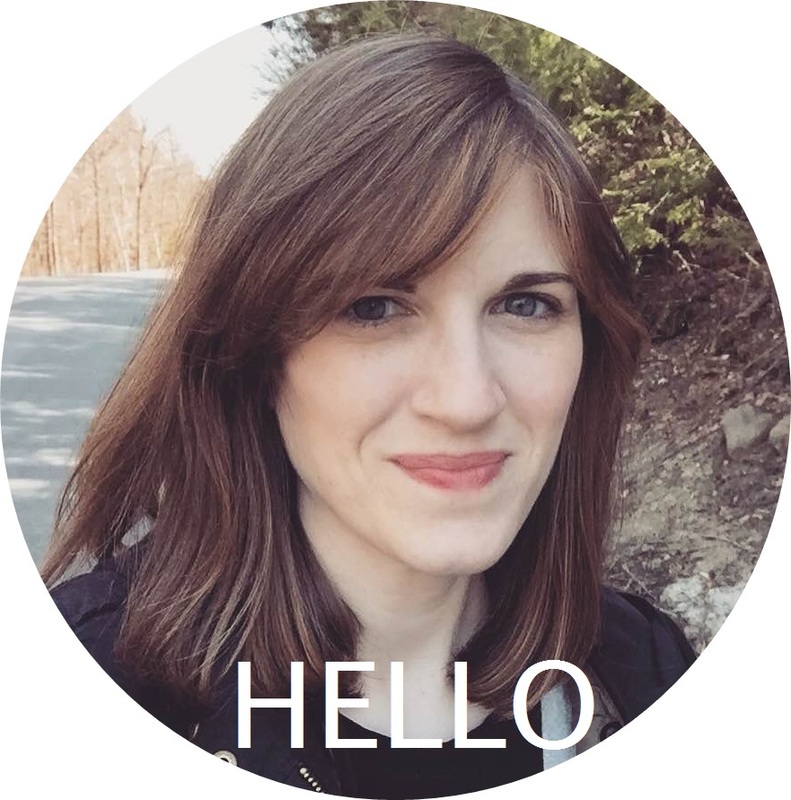 Courtney, my dream is to see Mayflower II in fill rig! My future 39 year old self can’t wait to party like it’s 1620! Hope things are going great with you, Greg, and Miss Ellie. She’s getting so big! Have a wonderful Thanksgiving!